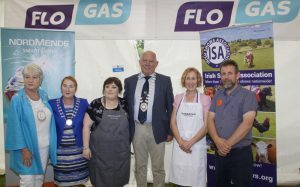 Sponsored by Flo Gas, NordMende and the ICA we were delighted to host the final of the ISA All Ireland Home Cook Champion 2017 for the first time. Hosted by chef Adrian and with a first prize of €1,000 the final turned out to be extremely exciting. Contestants had to cook a meal on site usingIrish ingredients. They were given the list of ingredients about ten days before the show. They were not allowed to use any other ingredients but did not have to use them all. In first place and Champion Home Cook for 2017 was Grainne Forest. Congratulation Grainne. A great achievement. Grainne is from Gorey in County Wexford.